Talisker: I am an Island. The bartender was there to take my order, not to be my friend. After a cursory glance at the whisky selection, I ordered Talisker. Neat. Glass of water on the side, please. It was a whisky I'd had when I was playing a show on the Isle of Skye, but I'd never ordered elsewhere. I couldn't even remember if I liked it. Since we arrived in Edinburgh, we've been on a quest to find "our local." About a week after settling in our Stockbridge flat, I ventured off solo. Going out alone is usually the easiest way to make friends, but that was not the case here. It was a Thursday night, and I'd been told about the traditional music sessions at the Antiquary, a proper pub a few blocks from our flat. A basement bar with dark wood and soft lighting, the Antiquary is a perfect picture of what I'd hoped my local would be. It was also only 7:30 at night and relatively empty. I smiled at the bartender -- a woman who I assumed was my age until I remembered I'm thirty-three, not twenty-three -- and she responded with no interest of becoming my friend. She wasn't rude or anything, just uninterested. After measuring out my Talisker, she muttered that there was a whisky tap at the end of the bar, not getting me that glass of water. Simon & Garfunkel went through my head: I am a rock. I am an island. Talisker is an Island whisky, but not an Islay whisky. Islay (pronounced EYE-lah) is its own island at least a hundred miles south of Skye. They are both breathtakingly beautiful (as all of the Hebrides are), but Islay whiskies are distinct for their intense smokiness. Talisker has a hint of peat, but nothing like my dear Laphroaig. I sipped it slowly, wondering with each drink if that would be the one to give me the courage to join the conversation. The bartender was talking with two men seated at the edge of the bar, who would occasionally look over at me curiously, but turn around every time I tried to flash a friendly smile. 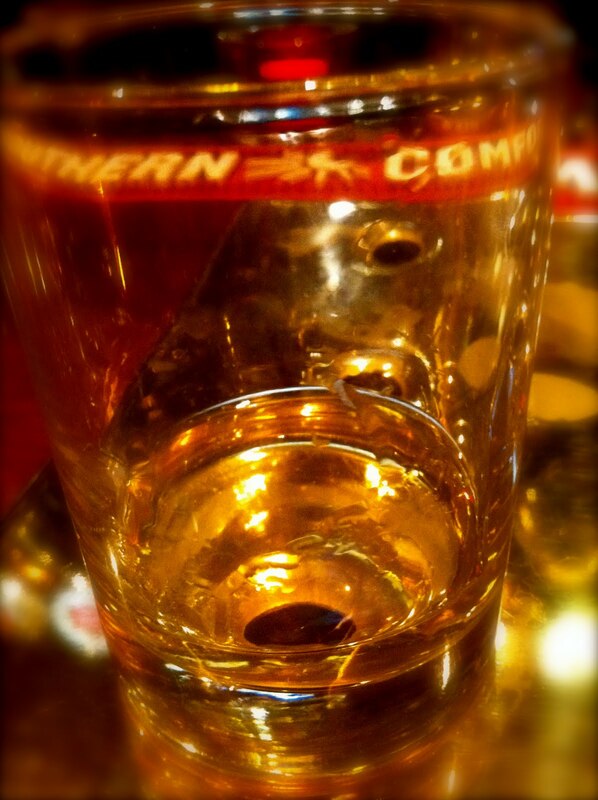 Defeated, I turned back to my whisky for company, fully knowing how sad this sounds. But the Talisker was there for me, spicy and still. I didn't need to be included. 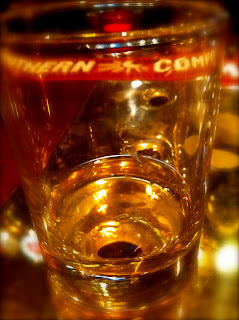 Soft gold and very pretty in appearance, this dram was a whisky of contradictions. Smells super-smoky, but tastes only slightly of peat. Tastes of pepper -- both black and chili -- but left only a slight tingle. After a few drops of water to dilute it, the smoky smell went away, and somehow tasted both sweet and savory at the same time. It's lighter than I usually like, but was perfect for the evening. Still on the quest for our local. Bourbon Girl in a Scotch World. I've tortured myself over whether or not to start a new blog during my time in Scotland. The Red Accordion Diaries is enough of a mish-mash of rants, raves, road trips, and recipes, that a few more blogs about whisky over there wouldn't be anything surprising. Still, I wanted something a bit more focused during this year-plus residency in Edinburgh, and what better to focus on than the sensual? People already know my hedonistic tendencies, particularly my fondness for all things whisky. I figured I'd find a little corner of the internet for this lovely little vice.